Place the salmon in the freezer for about 15 minutes while you prep the rest of the ingredients. The fish will be much easier to cut if it is very cold. Remove the tarragon leaves from stem and smash into a paste, using mortar and pestle. Combine with about 1 Tbsp. olive oil and reserve. Dice the salmon into 1/2 cm size or smaller cubes. Combine with sliced scallions and lemon zest in a small bowl. Dress with about a ½ tsp. of olive oil, sea salt and pepper, to taste. Form the tartar. If using a ring mold, start with the base. Arrange slices of avocado to cover the bottom. Sprinkle the avocado with a little lemon juice to avoid discoloration and season lightly with salt. 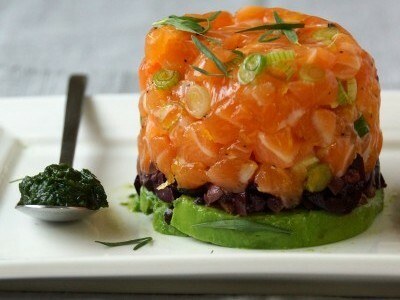 Spread the minced olives over the avocado, and top with the salmon mixture. Once you’ve filled your mold, refrigerate for 15 minutes or longer to help it firm up and hold together. Place tartar on a plate and remove the ring. Smear the tarragon oil across the plate or serve in a spoon to use as a condiment with the tartar.